Summerfest is back on. For six years, the Windham community has come together in conjunction with the town to put on Summerfest. Events taking place from the parade in the morning to fireworks at night and everything in between have been a draw for residents. When Summerfest was called off due to lack of volunteers, many in Windham cried foul. With the help of Ron Eby and Kelly Mank (the publisher of The Windham Eagle), a committee has been organized to spear head Summerfest, but with a few substantial changes. The new Summerfest committee will be Kathy Varney in charge of booths including food and businesses. Robert York will head up fundraising. 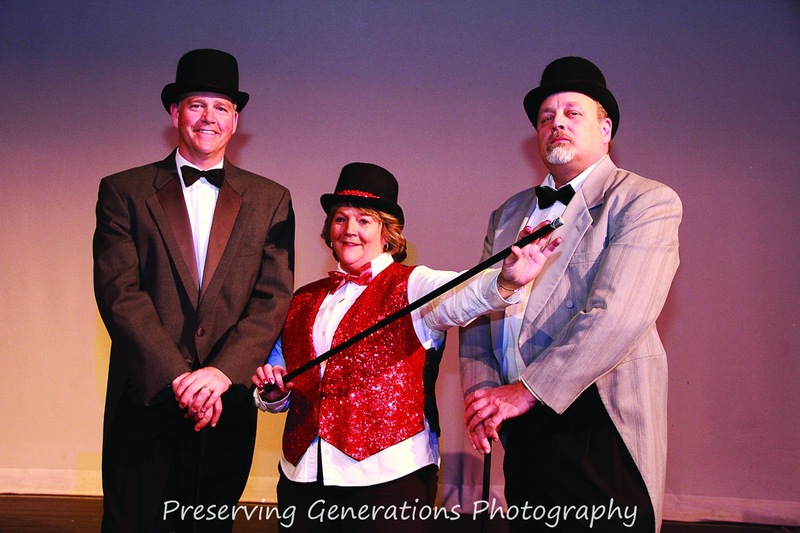 Julie Arsenault will organize entertainment for the center stage. Kelly Mank will run marketing. The parade will continue to be organized by Clarence Wisecup and the “Duane Clark” Memorial car show will be run by Stan and Cheryl Page. “I’m thrilled to death that you guys are doing this. I was down in the dumps (when it was cancelled),” said Wisecup, who has coordinated the parade for six years. Organizing the committee isn’t the only key to Summerfest. Volunteers are needed to work on each of these committees and on the day of. There will be a call for high school students to volunteer time to walk the parade route and help with set up and take down of the venue at the school complex on Route 202. The biggest change being proposed by the new committee is to change the hours of Summerfest from an all-day event to one that begins at 3 p.m. with the parade and continues through the 25th anniversary concert by the Windham Chamber Singers and ending with the fireworks, which have been donated this year by Central Maine Pyrotechnics. This donation will save Summerfest thousands of dollars. Fundraising efforts are being coordinated and may include a stuff-the-truck bottle drive, a donation only method and other events. The idea is to raise enough money to continue to bring citizens the parts of Summerfest they have come to know and love, said Mank. One of the goals is to keep the event local and not pay a lot of money to have groups come from outside the area. “We have to share the workload,” said Tom Bartell, head of the Windham Economic Development Committee. A top priority is finding someone to update and retool the Summerfest website and the Facebook page to get the word out and allow organizations to sign up for booths and volunteering. Planning is still underway and fluid, according to Mank. But have no doubt, “We are back in business,” said Wisecup. There will be a Summerfest volunteer meeting at Time4Printing, 588 Roosevelt Trail, on Tuesday, March 26 at 6 p.m. Everyone interested in contributing and hearing more should attend. Pender Makin began her career in alternative education by default, unable to find a job teaching English. ”About three quarters of the way through that first year it occurred to me that I could do no other kind of education,” she said. “I fell into it by chance, and by default, and I stuck with it because of absolute passion and love for working with these kids.” After seven years at a program in Westbrook, she came to RSU 14’s REAL school as principal in 2003. In 2013, she has been named the Maine Secondary Principal of the year by the Maine Principals’ Association. “It’s a really big honor,” Makin said, adding that she’s also humbled by the experience. “I can’t emphasize strongly enough all of the credit goes to our students and staff. They make me look great and now I’m just riding their coattails and collecting accolades for what’s really done by these amazing people.” She added that she’s pleased to see the MPA recognizing an alternative program for the prestigious honor. On a Friday afternoon, the school was buzzing with activity. Makin explained that it was the culmination of a service learning project that students had done in conjunction with Maine College of Art (MECA) students and their instructors. They created a school improvement plan, including a new outdoor sign, painting inside, and display boards for student work. Students were involved in all aspects of the project, from planning to color palette design to prepping, priming and painting. Other students that afternoon were across the state on hikes, stocking shelves at the Preble Street Resource Center and helping the Portland Water District with a project to raise a submerged hiking trail back up for use as an educational center. While this isn’t the scenario every day, the REAL school is founded on project-based, service learning educational practices, Makin said, and every day students work on planning these projects. “We try to take whatever (students) would be doing in the classroom and find a way to make it useful and real, and as student directed as possible,” Makin said. This includes programs like their farm to table school lunch program, in which students grow and harvest local ingredients to include in their meals, then plan, prepare and serve all the meals. Other projects have included taking students to Florida to save sea turtles or to Washington D.C. to deliver a story students had recorded and edited about a veteran to the Library of Congress. “Our students are creating things that go out and have a greater impact in the world, which for them is important,” Makin said. 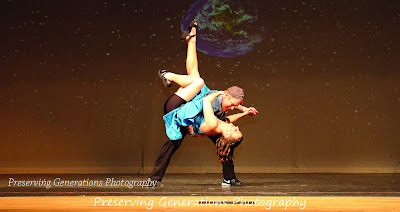 On Thursday, March 14, teachers and staff of RSU 14 presented round one of the third annual Dancing with the Staff to a packed auditorium to raise money to benefit the class of 2013 Project Graduation. The show opened with introductions of the ten couples – some returning from past years, others making their stage debut. As they played to the huge crowd, energy in the auditorium was high. Master of Ceremonies Bill Ellis and the panel of judges offered witty, unscripted banter throughout the evening. The show moved smoothly between dances, each lively and unique, spanning a wide range of styles. Dancers participate for a variety of reasons, but it all comes back to teachers and staff being invested in the students, said director Mary Wassick. Wassick created Dancing With The Staff three years ago, when she had a child in the graduating class. The idea, she said frankly, was “stolen” from a senior in high school in Westbrook, who was planning a similar event in her community. Dancer recruitment wasn’t as difficult as it was the first year, said Wassick. “There was still an amount of begging and bribery involved, but I really did have couples come to me this year.” She began with a first meeting for dancers in September. Many participants met with their volunteer choreographers and began practicing as early as November, while others started just a few weeks prior to the event. Dancing with the Staff has made over $10,000 each year, which remains the target. “This year I think we’ll probably blow that one out of the water,” said Wassick, “only because of local business advertising with us.” This year, ad sales were close to $4000, and ticket sales are slated to go over $10,000. While that may seem like a huge amount of money, Wassick said that the bills for Project Graduation are extremely high – in the $30,000 range. “I’m not sure people realize how much work goes into Project Graduation,” she said. Project Graduation, an after-graduation event for all seniors, is not part of the school budget. Instead, parents spend the whole year fundraising and working on the event. This year, the Project Graduation committee has just six members, including highly dedicated co-chairs Mary Anne MacArthur and Linda Nielsen, said Wassick. The first year, Dancing With The Staff had an elimination component, which didn’t feel quite right Wassick said. 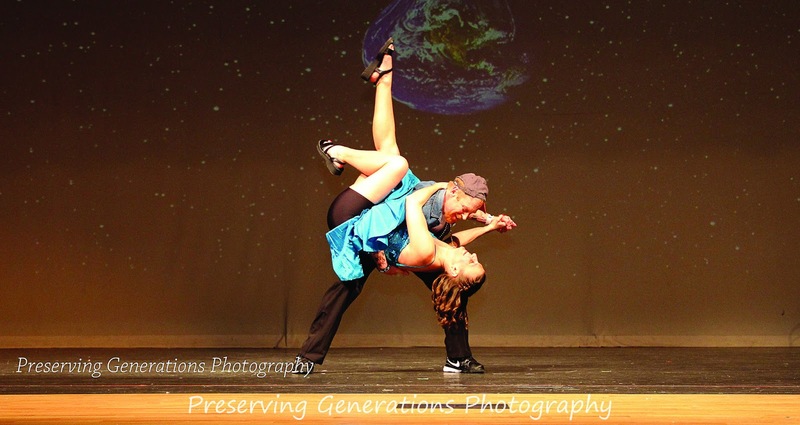 This year, all ten couples will return for another dance at the March 28th finale. The top three on the 14th were Rebecca Cole & Travis Guerette; Andrea Lavigne & Adam Beal and Kelly Bragdon & Ted Becker. Although there is a panel of judges, the winner is decided entirely by the audience. The ballots from the 28th will be combined with those from the 14th, and the popular vote wins. Fans can also “like” their favorite act on the event’s Facebook page, and the one with the most likes will receive 10 extra votes. “You can tell by just being there, the event itself is such a community event,” said Wassick. “It really brings together our staff and our parents in a really fun way.” The biggest issue that arose at the show on the 14th was last minute scrambling to find places for people to sit, a good problem to have, Wassick said. For the finale on the 28th, she suggests buying tickets in advance at any RSU 14 school, and then arriving early to get a great seat. A call for local businesses to step forward to keep the Windham tradition afloat. After last week’s news that Windham’s Summerfest was cancelled a concerned group of citizens began exploring the options of having Summerfest, but in a way that can help grow the event in future years. “Summerfest can happen and should happen,” said owner of Windham Automotive Ron Eby, who was heavily involved in the planning of Summerfest for five of the last six years. “It’s going to take a dedicated group of people,” he said. Summerfest is an annual event that is run by the community for the community. It has never made a profit for the town and isn’t designed to be a money making event. The challenge for the 2013 Summerfest, scheduled on June 22, came when very few people stepped forward to volunteer their time and talents to bring the event to fruition. In past years, it has cost between $17,000 and $18,000 to hold the event and that is with many items being donated outright. The Windham Police Department doesn’t charge for the additional patrols needed the day of the event, RSU 14 donates the location, power and the clean-up crew, others donate their time. The previous year’s volunteers deserve thanks and praise for the work they have contributed to keep it going for six years, said Eby. “There are a lot of underlying costs that people don’t see,” said Eby. “No one wants to see Summerfest go away but its continued presence cannot rely on town staff and a handful of volunteers. Summerfest belongs to the community; broader participation, commitment and investment of time and money are needed to ensure its future,” said Town Manager Tony Plante. A small group of business owners Eby, Kelly Mank (owner of The Windham Eagle), Director of Windham Parks and Recreation Brian Ross and Windham officials, are planning to meet to discuss scope and options for this year’s event. The most important part, Eby said, was that the community realizes that the town government is not running the event – the community is. Eby believes that with dedicated, goal-oriented people who do not want to reinvent the wheel, a committee can bond and successfully bring back Summerfest from the brink. “Anyone who is going to participate needs to be treated with respect,” said Eby. The Summerfest parade has its own committee and budget of approximately $3,000 headed by Clarence Wisecup. The car show is run by Stan and Cheryl Page. The rest of the event, from food booths and entertainment to the business fair and fireworks, is coordinated by a committee, but at this time it is in need of more volunteers. “The goal of the committee is to create a community event that brings a great cross-section of community businesses, civic groups, community groups and church groups together to share in the pride of our community. It’s a partnership,” said Eby. There is a website for Summerfest, but it is not being used to its full potential, according to Eby. “I’m a huge advocate as well as I believe other businesses are in offering or donating our local services or products free or at cost in exchange for sponsorship to help our local community,” said Mank. “It’s tough because everybody is stretched so thin. Businesses have to see the value,” said Eby. One of the events that scheduled to take place on June 22 is the 25th anniversary of the Windham Chamber Singers. It was suggested that Summerfest be used this year to help promote the concert and possibly capping the night off with a fireworks display. That being said, in order for a group to save Summerfest, volunteers are needed for fundraising, organization, entertainment, publicity and more. “It needs to happen soon,” Ross said. He feels there needs to be one person to “lead the charge”, and a group of 10 to 15 people running everything. “There is a lot to handle,” said Ross. The most iconic parts of the event are the entertainment and the fireworks. Even in a scaled down model, Ross believes these are some of the important facets. “We put a lot of effort into it the last six years. We want to see it happen and see it happen correctly,” said Ross. There will be a Summerfest meeting Monday, March 26 at 6 p.m. in the Time4Printing offices, 588 Roosevelt Trail. All interested businesses, individuals and organizations are encouraged to attend. “It’s a great event. It should not go away. It’s going to take a dedicated group of people to continue the tradition of Summerfest into the future,” said Eby. On Thursday, March 7th, the Manchester School offered students an opportunity to learn about health and wellness that goes beyond simply eating right at their annual health fair day. Jamie Pappalardo, a fourth grade teacher at the Manchester School and one of four health fair committee members, said, “During health fair day, we provided opportunities for the students to learn about various lifestyle choices that promote healthy living.” While healthy eating is certainly a part of that, students also had the chance to learn about personal hygiene, exercise, team building and goal setting, all of which contribute to a healthy lifestyle. There has been a health fair day at the Manchester school for many years, and the goals of the event have remained unchanged, said Pappalardo. These goals include teaching students to use decision making and communication skills to enhance health and reduce health risks, to use goal-setting skills to build better emotional, social and physical health, and to work cooperatively in order to achieve a goal. The day provided a balance of activities and presentations for students. Eliza Adams and Kate Thomas presented a segment about personal hygiene. A discussion on the food pyramid and healthy breakfast choices was presented by Stephanie Joyce and Jeanne Reilly. DARE Officer Matt Cyr offered a presentation on canoe and kayak safety, and Todd Wing presented a team building session. Classroom teachers were active participants in the day, speaking with students about the importance of goal setting, and then guiding students through the goal setting process. There were plenty of active events throughout the day as well. With the recent snowfall, students were able to get outside and take advantage of healthy winter exercise options with snowshoeing and ice sculpting. “It was exciting to see the teachers building forts and sculptures with students in the snow,” said Pappalardo. A healthy lunch of tuna or turkey wraps, a fruit and veggie bar, a yogurt parfait and milk options was provided as well, to promote healthy eating. “Manchester School recognizes that student wellness and good nutrition are related to physical and psychological well-being and readiness to learn,” said Pappalardo. In addition, the school also recognizes that these students need access to healthful food and the opportunity to be physically active in order to grow, ideas which coincide with the wellness policy of RSU 14, she said. With events like the health fair day, the school is able to guide students through various activities and lessons that provide students with important base knowledge in these concepts. The health fair committee for this year was Pappalardo, along with fifth grade teacher Andrea Lavigne and special education teachers Jeanne Watts and Kate Thomas. The Windham-Raymond School District Board of Directors opened budget deliberations Wednesday, when district Superintendent Sandy Prince presented a proposed fiscal year 2014 budget of $39.8 million, an increase of 2.26 percent over the fiscal year 2013 budget. Prince said continued budget challenges facing schools across New England provide the district with opportunities to prioritize and become more efficient, while fostering a commitment to innovation in the classroom. “I think we are a highly efficient and highly performing school system. I think people get an incredibly high value for what they pay,” Prince said. Salaries account for 74.51 percent of the proposed budget, while 17.51 percent will go to services, supplies and equipment and the remainder to debt service and other commitments. The first of the district’s cost-center presentations will be at 6:30 p.m., Wednesday, March 20 at the Windham Council chambers. There’s a problem with the cooler. It doesn’t represent the time period, one judge commented. “Nice aging,” another said. A bell ringing was missing when someone went out the imaginary door, another audience member commented. The critics were nit-picky at this performance, but that was exactly what director Matthew Ryder and his cast wanted on night number two of three preview shows at Windham Performing Arts Center this past weekend. The 28 students involved in the one act competition performed Shirley Jackson’s The Summer People, a story about a couple from away, who decide to stay on at the lake beyond Labor Day. The couple, played by Brad Meader and Maria Sepulveda, realize that something’s a little different about the town after the traditional last day of summer. The audience gets sucked into the Maine community and the unique characters played by Matthew Scala, Whitney Bolduc, Kiara Tringali, Avery Topel and Jameson McBride. The one act competition is strict. Schools are allowed five minutes to set up, 35 minutes to perform with a five minute grace period and five minutes to “strike the set”, which means to make sure that nothing is left on the stage. If the cast goes over the limit or leaves something on the stage, they are disqualified. Points can be taken off for inaccurate costuming, lack of projection or if the sounds don’t match the action happening on stage. Windham is unique because for the past few years the pit band, this year made up of Nicolas Gleason-Boure, Adam Poitras and Kris Dow, are performing an original work by Gleason-Boure that captures the tension of the play. At the beginning of the performance, Johanna Stanley and Kyah Morrissette creatively act out a scene naming all of the sponsors, garnering chuckles from the audience. The talent on the stage ranged from the actors and crew to the producer, music director and sound designer Brenna Ryder and stage and set manager, Michelle Begley. The cast, which began rehearsing after Christmas break, will perform in the regional competition at Morse High School in Bath on Saturday, March 9 at 4 p.m. The Maine Public Safety Pipe and Drum Corps performs in parades, at funerals, weddings and now they can add New York City to their list after ten of their members traveled to play with Nassau County Firefighters Pipes and Drums in February. The Maine corps is comprised of approximately 30 members, seven of whom live in Windham and two who live in Standish. Sean Theberge, the pipe major who plays the bagpipes, was one of the members who lives in Windham and traveled to New York. The other is Irene LeClaire, who is in the color guard. The organization came into being in August of 2005. They decided as a group not to charge people when they played at funerals for law enforcement and firefighters, which others did. The corps plays at Byrnes Irish Pubs in Bath and Brunswick on the seventeenth of every month in anticipation of St. Patrick’s Day. Other practices are held weekly at the Freeport Fire Department or at the Sheriff’s Office in Portland. When the group practices or when they perform on the seventeenth of every month, they pass around what they call the Christmas sock, according to LeClaire. The money accumulates until the corps decides to give it to “a charity of some sort. Normally it goes outside of the corps,” she said. At Christmas this year, the corps decided to give the sock money to a family in the Nassau County Firefighters Pipes and Drums who lost their house during superstorm Sandy. LeClaire suspects that the money raised was close to $2,000, after the passing of the sock and the matching funds added by Byrnes Irish Pubs. The idea came from one of the Maine members, Brian Young, who moved to the area from Long Island. He suggested donating the money to the family. In February, the Nassau County group hosts a large fundraiser called the Irish Bash Fundraiser to raise money for their organization. They personally invited the Maine corps down to play with them because they were touched by the donation. According to LeClaire, no one plays with them at their fundraiser. This was a huge honor, according to LeClaire. “They treated us like royalty,” said LeClaire. Once there, the Nassau County’s pipe major arranged for the New York Fire Department to tour them around the city including stops to perform at Central Park, Times Square and at the fire station across from Ground Zero. “We always start and end with Amazing Grace,” said LeClaire. “It was a very moving experience,” said Band President Mark Arnold. The Maine Public Safety Pipe and Drum Corps is always looking for new members. They teach people how to play the bagpipes, which can take as little as four months or can take longer if one has never played. The kilts, which cost $600, are earned through doing so many performances or helping out at parades and functions. It can be pricy to be a part of the group to start, but the family like atmosphere makes up for that LeClaire said. “We have a blast. One thing about the Corps is they all treat one another like family. They hug hello and they hug goodbye,” she said. LeClaire as well as her daughter, Renee and son, David are involved. Other Windham residents who are a part of the Corps are Chris Cota, Theberge, Doug Estes and Carol Waig. Kevin and Penny Joyce are members who live in Standish. In addition to the sock money they donate, the corps also gives a $500 scholarship to a student who has a connection with Scottish heritage or public safety. Last year the scholarship went to a fire science student in Bangor. On St. Patrick’s Day watch for them at RiRa Irish Pub and Bull Feeney’s in Portland and Byrnes Irish Pub in Brunswick and then the one in Bath. FMI, visit www.mainepipes.org. The Maine Public Safety Pipe and Drum Corps dressed in their Maine tartan kilts performed in prime locations in New York City while being escorted by New York Firefighters. 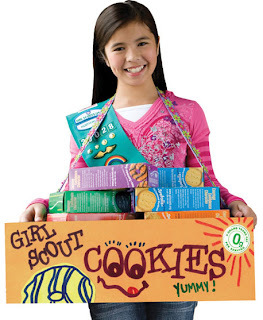 If you have the MILK, the Girl Scouts have the COOKIES! Last Saturday, the Girl Scouts of Maine leaders greeted a semi-truck filled with cases of Girl Scout cookies as the truck dropped off the cookies at two locations, one in Windham and the other in Standish. Leaders in Windham gathered at the North Windham Union Church on Roosevelt Trail. Once the cookies were separated by troops, the orders were sent home with leaders, and then divided by Girl Scout to be delivered door to door. Forgot to order cookies? 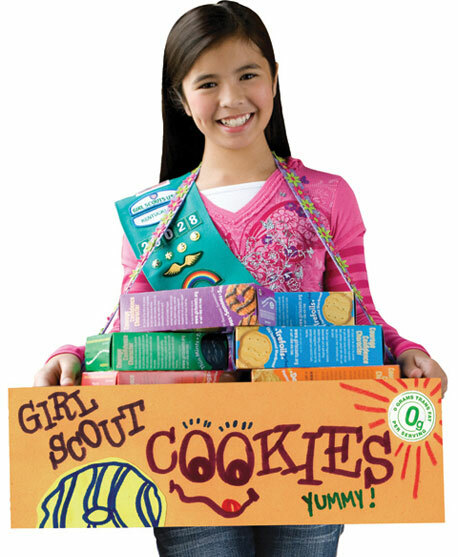 Watch for booth sales set up around the area on weekends or contact your nearest Girl Scout. Cookies are $4 per package.